I was introduced to Jonna Roti when my Athamma prepared it at home. She got the flour from Andhra with her, when she came down to stay with us. Hailing from Anantapur, they have a great influence of Karnataka over their cuisine to some extent. Knowing few dishes that are prepared at their home, I am not sure if it belongs to Andhra or Karnataka. Jonna Roti is one such dish. This is more of a staple bread to them than anything else. Whenever Athamma makes this, she fondly remembers her mom and recollects her many childhood events that revolved around this Rotis. 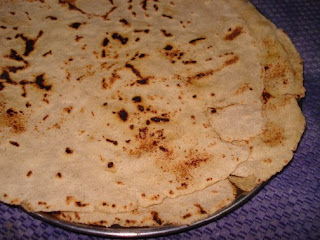 Infact rolling out this roti is an art that is learnt from childhood and not an an easy one to master. 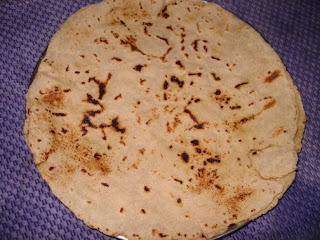 I even took a video of Athamma rolling out this roti but it ended up being such a huge file that Blogger wouldn't load. So will have to have the video session taken some other time. Athamma makes Jonna Roti frequently for dinner as this is supposed to be healthy. This can be taken by people who want to loose weight or have diabetes. Now this roti is something that my daughter is fond of too. And she eats just like that. Athamma suggests this to be served with any Non Veg gravy, Nune Vankai or even Sambar. The way to eat this is to tear the roti to pieces, pour the gravy over the top , let it soak and then eat. yummy! In towns or villages, they pound the flour directly from the grains. But these days you get ready flour, but these lack the gum to hold the rotis, so Athamma add a tsp of wheat flour to give the stickiness. Enjoy, check out the Video.